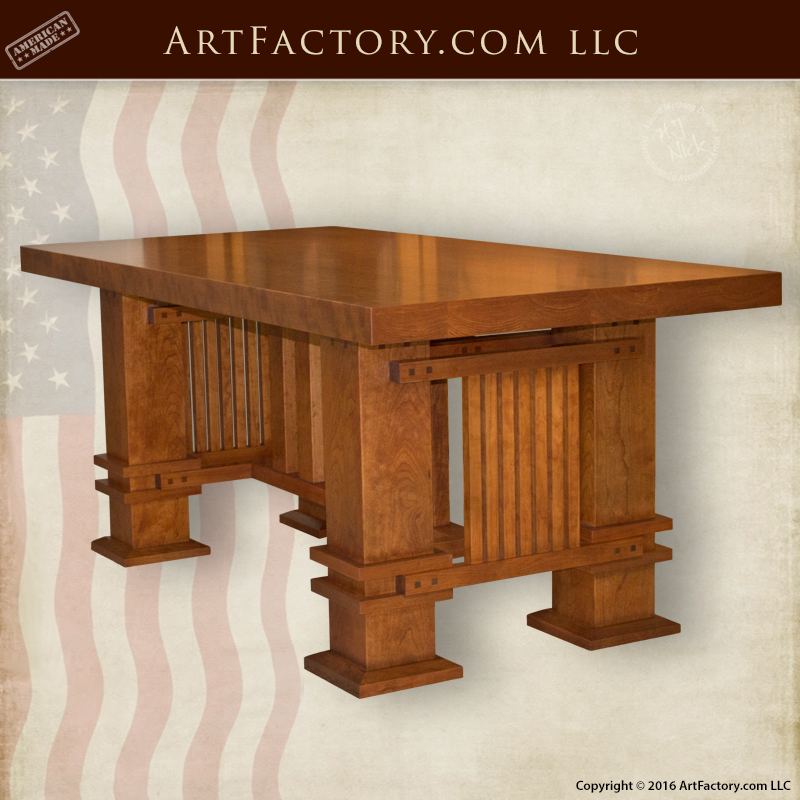 At ArtFactory.com, we created this custom craftsman style table design inspired by Frank Lloyd Wright's 1899 design for the Joseph Husser House. The table is built in original hand and craft from old growth cherry wood. Like all of our custom wood furnishings, this table is hand hewn with mortise and tenon joinery. This type of craftsmanship ensures that your product will stand the test of time. Additionally, the table has been finished to fine art quality, using a multi-step hand rubbed process. This process blends the finish into the grain of the wood so that it won't fade, flake, or crack like painted on finishes. Finally, each product is built under the supervision of world renowned artist H.J. Nick. Every product that leaves our shop is stamped with the H.J. Nick seal. This ensures that your custom furnishing is an original work of fine art never to be mass produced, machine made, or built using and kind of fast process. All of our custom, fine are furnishings are hand built by master craftsmen at our Scottsdale, Arizona factory. At ArtFactory.com we build custom wood furnishings from solid, full length, American timber that is naturally air dried. 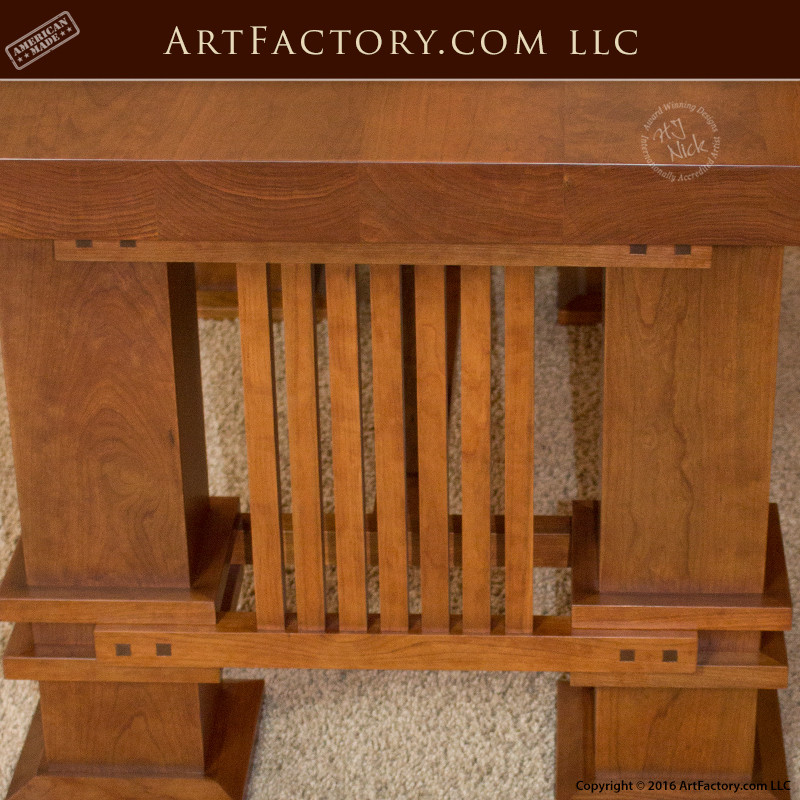 Furthermore, historic designs such as this custom craftsman style table are always build using the same traditional techniques, such as were used to build Frank Lloyd Wright's original table over a century ago. This makes for a unique, and one of a kind, heirloom quality furnishing that can be cherished for generations and will build antiquity value overtime. To top it all off, we guarantee our products forever. We work with dealers, builders, interior designers, and home owners to create custom made furniture for your residential or commercial property. 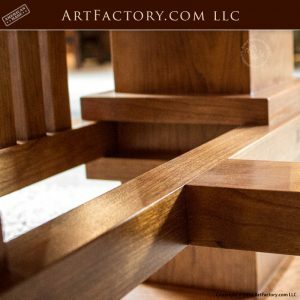 Our custom furniture is available in any size, style, and finish by our American craftsmen, hand made using old world techniques to create a luxury fine art furnishing for your project. All hand crafted, solid wood furniture pieces are built using full length, solid wood. Further customize your solid wood furniture with hand carved designs, custom hardware, glass or granite, or hand forged wrought iron. 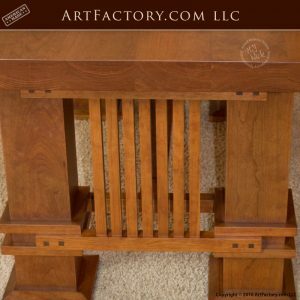 The choices are endless when you order your custom hand built furniture from ArtFactory.com. Call us to discuss your project and custom furniture designs at 1-800-292-0008. This work is from the New York World-Telegram and Sun collection at the Library of Congress. Wright was the pioneer of what came to be called the Prairie School movement of architecture and he also developed the concept of the Usonian home in Broadacre City, his unique vision for urban planning in the United States. In addition to his houses, Wright designed original and innovative offices, churches, schools, skyscrapers, hotels, museums and other structures. He often designed interior elements for these buildings as well, including furniture and stained glass. Wright wrote 20 books and many articles and was a popular lecturer in the United States and in Europe. 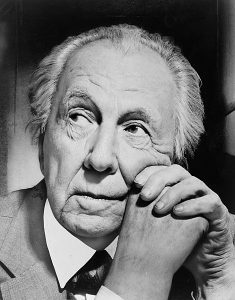 Wright was recognized in 1991 by the American Institute of Architects as "the greatest American architect of all time".